Skippy and Dave have logged many miles and over 3,000 performances across the country at schools, clubs, concerts, colleges, conventions, libraries, and countless fairs and festivals. Dave's cast of characters includes Skippy (his right hand man), Mozart the Dog, Bat Man the Bombastic Baseball Bat, and Skippy's would-be girlfriend for whom he is always pining, Claire da Loon. 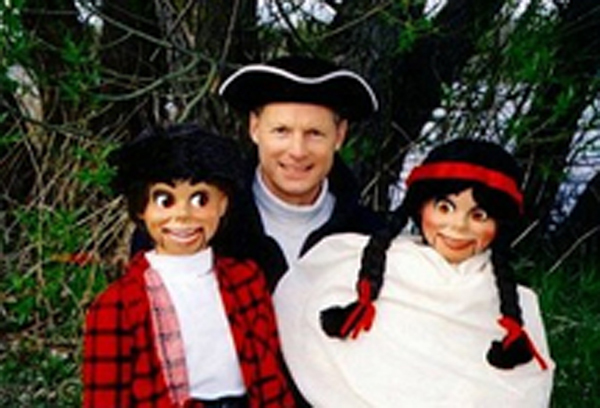 Parker and his partners prepare and polish each program for its particular patrons, and have performed shows with a variety of special themes including "Rock and Read"; an anti-bullying program for elementary and middle school students; and a very special Lewis and Clark show that features the cast in historical regalia as they portray Meriwether Lewis, William Clark, and the other explorers on the expedition. Before making the switch to full-time ventriloquist, Dave was a singer and songwriter on the college circuit who has recorded and released four albums and three videos, as well as the regional hit "The Old Buffalo," which raised money to restore a historic fire engine near Green Bay, Wisconsin. Some of the most exciting moments of any program are when Dave combines his skills as a ventriloquist with his musical talents. Traveling with his own sound system, Dave can set up anywhere and is equally at ease in a 1,000 seat auditorium or on the back of a flatbed truck, and he often goes where no ventriloquist has thrown his voice before. Dave is known as the "Iron Man" of school assemblies, having performed for over twenty years without ever missing a date, and has earned a reputation as being a heckuva nice guy to work with. Some of the highlights of Skippy and Dave's career have been opening for the likes of magician David Copperfield, being featured in the nationally distributed book Dustin's Big School Day, and performing as a main attraction at the world's largest aviation convention.